Using the stories and voices of Ethiopian and Eritrean taxi drivers as inspiration, ten Bay Area artists have created a special pop-up art installation called “Home Away from Home” on a park lawn near Lake Merritt. The show is part of a series of local events honoring the Ethiopian and Eritrean new year. Ethiopians and Eritreans around the world hold their New Year’s Day on Thursday, marking the end of the rainy season in eastern Africa and the start of that region’s spring. Though Bay Area Ethiopians and Eritreans will not be celebrating the day with a change of weather, one of the highlights of the week here is “Home Away from Home,” a temporary gallery set up in traditional-style circular home— an Ethiopian gojo, or Eritrean adjo—right in Eastshore Park, next to Lake Merritt. “We wanted the theme to be ‘home away from home,’ and we thought, ‘Why don’t we take a home, away from home?’” said co-organizer Ellias Fullmore, an Ethiopian American musician and artist based in San Jose, California. The Eastshore Park lawn welcomes curious passers-by. Along the gallery walls, the wood designs in the circular structure cast patterns of shadows on the artwork, and the shadow art seems to take on a life of its own as dusk approaches. A nearby soccer practice and the sounds of cars driving by make it feel less like a museum and more like a home. Each of the artists who participated was given in advance a recording and a transcript of an interview with an Eritrean or Ethiopian taxi driver. 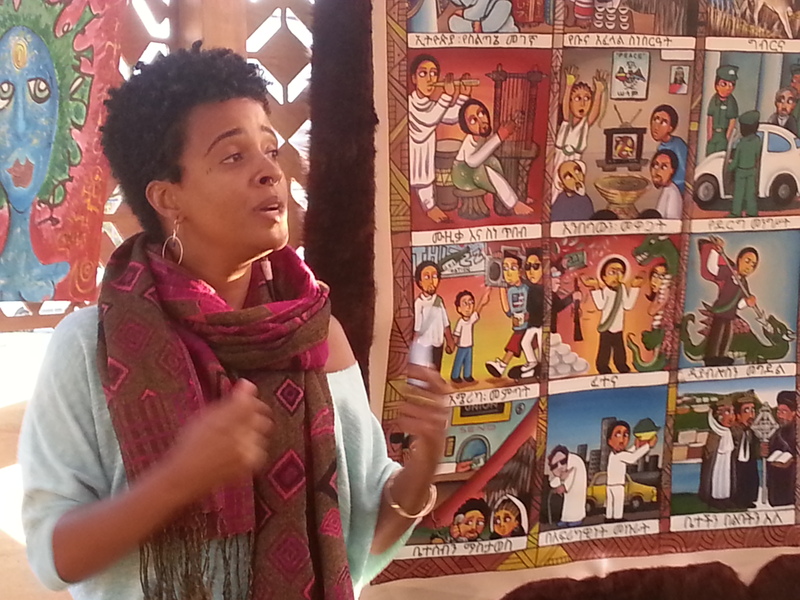 Though not all the artists are Ethiopian or Eritrean, they all have ties to the community. Without meeting or knowing the name of the drivers, the artists then used the taxi cab stories for reflection and inspiration. The art goes beyond the individual taxi drivers and touches on themes of home, travel, identity and space. Organizers Meklit Hadero, an Ethiopian-American singer, musician and cultural activist, andSephora Woldu, an Eritrean American visual artist and filmmaker, conducted the initial interviews with the drivers, and each of the ten artists created his or her own interpretation through art, music and poetry. In explaining the importance of taxi drivers, Woldu said theirs are “stories of migration” that “inspired new artwork from artists who wanted to honor their experience.” Many Ethiopian and Eritrean immigrants settle into taxi driving, Hadero said. “Everyone has an uncle or cousin who is a taxi cab driver,” she said. The Bay Area is home to a large Ethiopian and Eritrean population. While the statistics do not account for people who are originally from Ethiopia, but traveled through other countries, according to Hadero the population is close to 20,000. “It’s huge and it’s growing,” she said. In many cases, working as a taxi driver is also an immigrant experience around the United States. In 2000, a Brooklyn-based consulting company found, nearly 40 percent of taxi and limo drivers in the United States were immigrants. Zéna happened to be matched with the transcript and audio from a female taxi driver. Her watercolor painting for the show, which she calls “what was lost, what was gained,” has an almost religious feeling. The dominant image is a woman’s face, with bright purples and reds surrounding her. The neck gives way to what appears to be a deer, and hands that hold strings woven into an old-school boombox. Home Away from Home is part of a larger initiative sponsored by the Yerba Buena Center for the Arts and Bay Area Now (BAN7). BAN7 aims to make art more accessible to all people. BAN7 pairs artists with community members for projects like this, to provide participatory arts experiences in places like parks, neighborhood centers and housing complexes. Other projects include collaborations with artists in SOMA, Mission, Excelsior and West Oakland. “Mostly I do my art for myself,” said Natasha Shompole, a Kenyan-born visual artist, now living in El Cerrito, whose painting in the show is called “Nara.” The taxi driver Shompole was paired with, she said, had traveled through nine different countries to reach the Bay Area. Shompole’s piece depicts the profile of a face at the bottom left with an elaborate crown of shapes with nine points. The lines from each of the nine points are strung together like a geometrical spider web. “I am hoping people will see, or at least think about, how the small components make a whole,” Shompole said. She might just as easily have been describing the Ethiopian and Eritrean community in Oakland. This entry was posted on September 12, 2014 by Lakshmi Sarah in Writing and tagged Bay Area, taxi driver.